Last summer we embarked upon a fairytale road trip that included some ferry tales – one month and 6100 miles, from Minnesota to Alaska and back, via Canada. Trip of a lifetime, right? Of course! Did I mention we were traveling with a three-year-old? Turns out, it didn’t really make a difference. We travel like a wolf pack; there is no such thing as a romantic getaway or even much “me time” and we embrace that. This includes road trips. Even very long ones. Most people called us crazy, but we wouldn’t have it any other way! So for those looking to brave the pavement this summer with little ones in tow, here are some tips to make the extended road trip with kids smooth sailing, or driving, or if you’re like us—both! I started planning this trip about five months prior to our departure. We needed to take care of the BIG things like formally requesting personal time off at work and making sure our chickens would be cared for while we were gone. So take care of those things first – the things that will dictate whether or not a longer road trip is even possible for you! Next, plan around the season in which your children reside. Still napping? Don’t fight that. Embrace naps. Try driving at night and see if that works for the family. For us, this was not a great option – we’re both bogged down with glasses and we found it was better for us to stop before total darkness, bed down, and then start out in the pre-dawn hours (driving roughly the same amount of time behind the wheel just rearranged). Know the route. This is especially important while traveling in desolate places. (In our case, most of British Columbia and the Alaska Highway were sparsely populated.) If you’re camping, plan realistic drive times for each day and reserve campsites for each night. Popular places (Yellowstone, Yosemite, Banff…) will need months, maybe even a year of advance planning if for those craving an extended camping trip. Rolling into town late at night, even if you’ll be in a hotel, is the worst time to have to wander from property to property to find a place to stay because all the road-side hotels are at capacity. Organize it. I found it really helpful to have a folder of gas coupons, hotel reservations printed out, any phone number we might need for our campgrounds, activities, and other contacts, and all of our ferry tickets and such. I organize them in chronological order so I was prepared even if the clerk couldn’t find our room at 11 p.m. or a site was reserved but in-use when we pulled in. I’ve found this trick to be super helpful and worth the time spent before embarking on the trip. Map it out. 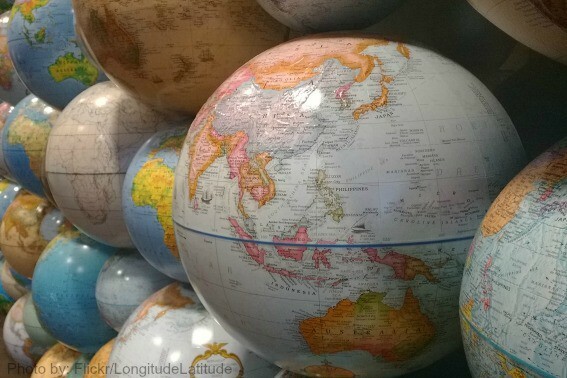 Even though I sometimes feel like we are the last souls on Earth that rely on an atlas when we road trip, try to add one (or at least a good map) to the mix. You never know when the Smartphone or Tom Tom or whatever brilliant technology you use will lose reception, break, or succumb to the elements. The Milepost was extremely helpful to us in planning out our leg of the journey on the Alaska Highway. Do the research and try to plot a route, it will save you many headaches when you’re on the open road! Nothing kills road time like pit stops. The kind that actually take you to some eccentric, amazing monolith on the side of the road is not what I consider a waste. No, it’s the stops for Cheetos. Someone didn’t refill their Nalgene and are now thirsty. Bathroom breaks and stretching out those legs is necessary, but all those small stops really add up. If you plan for your snacking, you’ll save valuable time. In our family, everyone knows that if mama gets hungry…watch out! My family knows enough to keep snacks handy to keep all of our inner monsters at bay! Can’t stand the crumbs in the car? Consider making a kit or investing in some road trip gear. My favorite hack out there is the use of a fishing tackle box (the clear, divided compartment kind) for kid snacks. You can perfectly portion all sorts of different edibles for the tykes and keep them fresh and contained for many hours of hunger-warding munching. Tip: Buy in bulk and separate into single portions. This will stretch the budget and it will cover several days of snacks instead of single-serve splurging. Stop at farmer’s markets along the way to get your fresh fix. 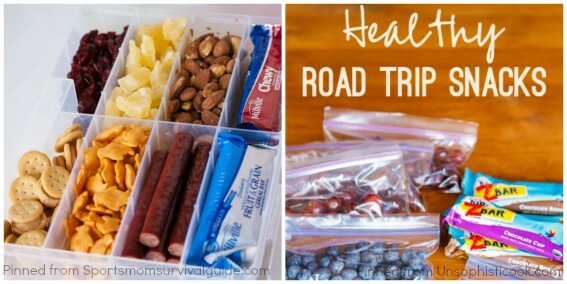 Check out this article for more tips on eating on the road! I blew this one big time. In my excitement for our epic road trip, I thought I had budgeted so well. I figured out gas costs (even taking into consideration the exchange and the volume conversion in Canada), and I included the pre-trip shopping spree for everything from food to lantern mantles. What I didn’t include was souvenirs, tips, and the splurges like shipping home fresh fish or eating several pounds of fresh crab. I didn’t include the obligatory licenses we’d need to go fishing. I didn’t include park fees. As the numbers added up, I realized I really overlooked some of those more hidden costs. Thankfully, I gave us a cushion that made the budget feel a little better, but planning down the price per toothpick is not always a bad thing! Worrying about money while you should be concerned with things like sunscreen application and the perfect backdrop for the family holiday card photo can make for a stressful trip. 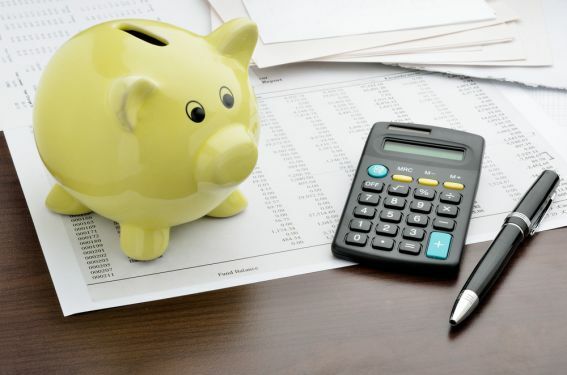 Make a realistic budget and try to stick to it. Tip: Each time you think you can resist the urge to buy a Venti Mocha Latte, take the precise amount you would have spent and throw it into a trip fund jar. It’s phenomenal how each little choice adds up to a big road trip! I blame the budget mishap on this category. Budget was my folly. Entertainment was my forte. I packed five small backpacks FULL of items that I’d been collected for many weeks leading up to the trip for my preschool-aged son. I had a little nook where I kept all of the goodies I was accumulating secret! Some of the best items included Color Blast No-Mess Marker Books, a small fishing game, a few new books, five new DVDs that would be strategically spaced out over the entire month, a Whoopie cushion, Silly Putty, a disposable camera, a ViewMaster with several slides, and some string, pipe cleaners, and pony beads. You will have to adapt this to age, but you get the idea! I tried to eek as much time out of each item in each bag as was possible when we were underway. Sometimes when he wasn’t thrilled with a selection, it was just ‘too bad.’ I kept all the bags in a specific spot in the vehicle, easy access but totally off-limits from little prying hands and eyes. Anticipation was a great cure for boredom as it turned out! Tip: Thrift stores, dollar stores, clearance aisles, and even a best friend’s junk pile can make for great resources when looking for entertainment items to fill your pack. 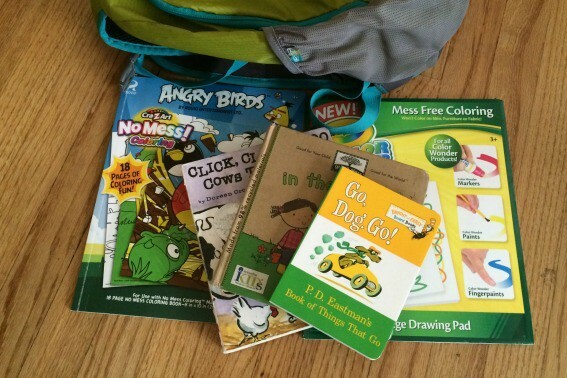 Go with the “new to you” theme for young kids – they are pretty easy to entertain! No one wants to drive a U-Haul during a road trip, but you also don’t want to leave the most important items at home or have to live out of a backpack like traveling in college. This is after all, one of the many perks of a road trip — you have your wheels and your stuff! So how do you pack for an extended expedition? Systematically of course! If you’re gone as long as we were, you’re going to be rearranging and repacking a bit. Try to have ONE bag that you bring into the hotel each night. This one bag should have what each family member needs for ONE night. (Toiletries, clothes, meds.) To make it easy, use all of those plastic bags one collects over a year to pack clothing for one night for each family member — that way you can just grab one bag out at the hotel along with toiletries and be all set! Have a large laundry bag (military-style rucksacks work great) for soiled items. If possible, pack one outfit for each purpose or weather condition (fancy dinner, rain, hot weather, etc.) and then plan to launder. Use solids and especially black to create your outfits. Think mix ‘n’ match. If you must go heavy on one thing – I’d recommend socks! Sometimes, there is gear that is repeatedly needed each day. Pack this in a very accessible area in the vehicle. There are kitchen kits, camping kitchens, and car trunk organizers out on the market, but for space-saving and customization, we’ve always found that rubber totes work just fine for us. “Rehab” your gear and totes before leaving each day — nothing is worse than greeting a messy kitchen kit when you lift the lid of your tote when you’re already famished! Try to dry your camping gear before packing – but if you have to leave and it’s wet, pack it on top and plan some time to pull it out and get it dry when you stop. Tip: Pack using a trunk-Tetris method that we honestly love but have yet to perfect in our family! Know when you’ll use supplies throughout the trip. 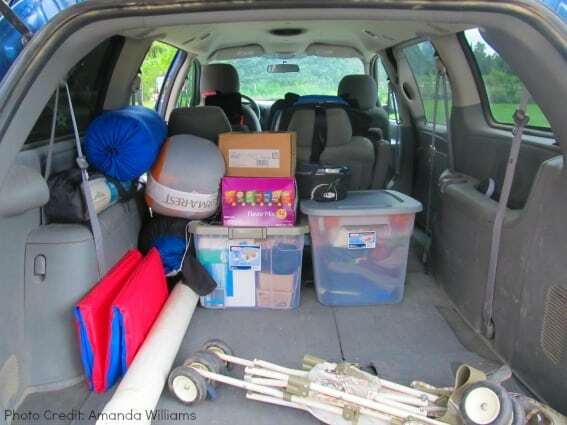 For example, if the camping part of the trip is first, I’d pack camping gear LAST and then once I’m finished with it, move it to the very back, least accessible part of the vehicle. Toss garbage at each pit stop so that by design the load lightens along the way. Lots of fantastic tips. I completely agree that a real map is an absolute must on a long road trip. There are still so many places that you can’t get a cellphone signal or it’s so slow it’s painful to be steaming any data.